Domina Aebbe (often corrupted to Domneva), is usually known as Ermenburga, though this was said to be the name of one of her saintly sisters. The other two were St. Ermengitha and St. Etheldreda of Kent. Along with SS. Aethelred and Aethelbert of Eastry, they were the children of Prince Eormenred, a sub-King in Kent under his father, King Edbald. 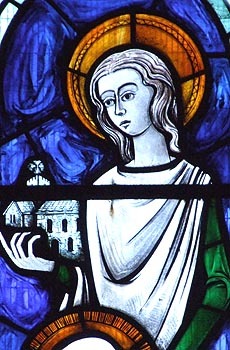 She married King Merewalh of Magonset and together they had at least three daughters - St. Mildred, Abbess of Minster-in-Thanet; St. Milburga, Abbess of Wenlock; and St. Milgitha, a nun at Eastry - and one son, Merefin, who died young, in the odour of sanctity. It seems likely that, during her time as Queen, Aebbe acquired some land now named after her at Abingdon in Berkshire. She may have been the ultimate founder of a dual monastery on the site of St. Helen's Church there, which was later superseded by the great Saxon and Medieval Abbey of Abingdon. She also has a church and a street dedicated to her in nearby Oxford. In AD 664, Aebbe's cousin, Egbert, succeeded to the Kentish throne. Worried about the Royal claims of the lady's two nephews - Aethelred and Aethelbert - and encouraged by a ruthlessly ambitious advisor named Thunor, he had the two lads brutally murdered. He later, however, repented for his hasty actions and, according to Saxon law, was obliged to pay weregild, or the 'price of blood' to the victims' next-of-kin. Egbert sent for Queen Aebbe, received her in great state and offered her whatever she chose to ask. The lady chose, as the blood ransom, a gift of as much land as her tame doe could run round in one course and the King consented. The spot chosen was the Isle of Thanet and there, in the presence of the King and his Court, Aebbe let loose the doe. Thunor, moved by envy and spite, tried to dissuade the King from giving up his lands at the instigation of a 'witch' and, being on horseback, set off in pursuit of the doe. He had scarcely started when the earth apparently opened up and swallowed him. The place, for centuries after, was called "Thunner's Leap." The doe continued her course and did not stop until she had encircled forty-eight ploughs of land. The King made a gift of all this to Aebbe and, after her husband's death, she built a monastery there, dedicated to the Blessed Virgin and in memory of her brothers (AD 673). This monastery was called Minster and was soon filled by seventy nuns and ruled by Aebbe as the first abbess. She died there on 19th November AD 694.